If you’re looking to cast a charming international villain, a cultured man whose devotion to his son and whose philanthropic front mask the fact that he’s a cold-blooded merchant of death, you can start and stop with Hugh Laurie. In AMC’s thoroughly enjoyable miniseries “The Night Manager,” Laurie, with a healthy tan and clear blue eyes, is perfectly beguiling and chilling as a billionaire arms dealer selling everything from guns to napalm during the Arab spring. His Richard Roper is a man of wealth and taste, happily sipping cocktails in the miniseries’ majestic settings, particularly the island of Majorca. But when he’s surprised by a glitch in his master plan or an unyielding enemy on the horizon, he is terrifying, fast-acting, deeply covert, and ruthlessly self-preserving. Publicly, Roper helps refugees and others in need; privately, he is the devil. Laurie draws all kinds of nuance out of Roper’s quiet contempt, his two-faced grins, and the creeping paranoia he is always trying to conceal. It’s a reverse image of Laurie’s performance as Dr. House, whose brash, sadistic exterior hid his brilliance and good work. Roper reels people into his web of secrecy — he ropes them — with a smile and an air of worldly glamour. And then wickedness inevitably ensues, which his beleaguered young American girlfriend, Jed (Elizabeth Debicki), has learned. The other star of “The Night Manager,” which is updated to 2011 from John le Carre’s 1993 novel, is less perfectly cast, but no less entertaining. Tom Hiddleston plays Jonathan Pine, a former British soldier who served in Iraq and is now the suave night manager at a swish Cairo hotel. He gets pulled into Roper’s orbit by a beautiful woman in the first of the six episodes, and he is approached by MI6’s tenacious Angela Burr (Olivia Colman) and asked to go undercover to bring Roper down. Pine agrees, and begins to insinuate himself higher and higher in Roper’s hierarchy with the ease of a professional spy. He keeps almost getting caught, which adds to the espionage fun in the middle episodes. The cinematography in “The Night Manager,” which premieres Tuesday at 10 p.m., is transporting, with the kind of idyllic beauty of a movie such as “The Talented Mr. Ripley.” But the camera is too eager to capture Hiddleston’s beauty, to eroticize him in a way that becomes unintentionally comic. 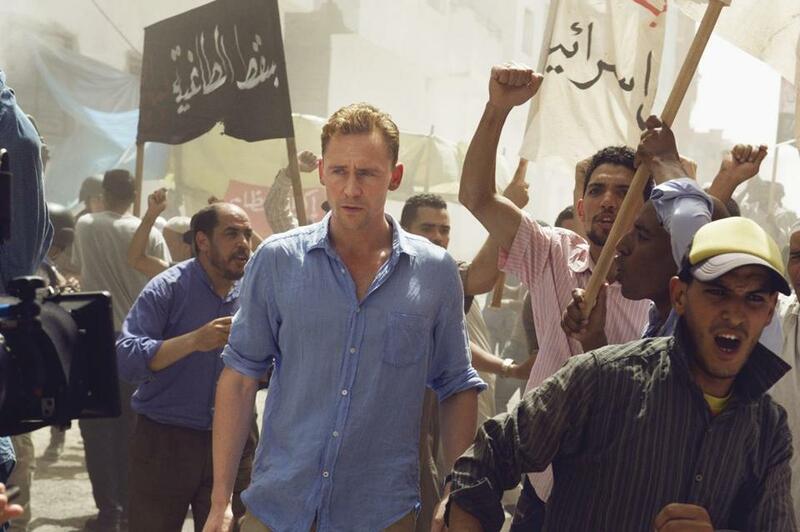 I don’t see any reason le Carre should not be sexed up a touch and turned into something more James Bondlike, with a more good-vs.-evil simplicity, as director Susanne Bier and screenwriter David Farr have done with “The Night Manager.” But highlighting Hiddleston as a British boy toy with model-like hair and skin only serves to undermine the story, since his rise with the shrewd Roper at times appears ridiculous. He needs to seem a bit wilier and less flatly amiable and pretty; how else could he be fooling Roper, assuming he is? What makes Hiddleston’s performance most worthwhile are his scenes with Laurie, where they’re both at work trying to fool the other into submission. It’s a deeply muted cat-and-mouse game cloaked in camaraderie. Colman, so poignant as the duped detective in “Broadchurch,” is a nice addition to the cast as the detective (who was a man in the novel). She brings an earthy and relatable presence to all the rarified doings of the very wealthy and the very evil. She’s pregnant and persistent, like Marge in “Fargo,” but she is also quite impatient and ruthless when it comes to getting her spies and informers in order. Alas, her bosses, some of whom are on Roper’s payroll, aren’t as supportive as she might hope. Also a plus in “The Night Manager”: Tom Hollander, who plays Roper’s chief of staff, Lance Corkoran. Indelible as Dylan Thomas in “A Poet in New York,” Hollander makes Corkoran into a repulsive, piggy drunk who can’t believe Roper is buying into the new pretty face on the scene. Hollander brings a visceral element to his character’s acute suspicion that, as it makes Pine squirm, will make you squirm as well.